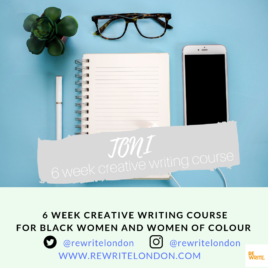 Want to improve your writing but can’t find the time to attend a course? Our online creative writing course is perfect for busy and hectic lives. The assignments are sent to you every morning, so you can do them whenever and wherever you want! This is a practical course designed to help you hone your writing and skills. Using a wide range of texts and audiovisual resources, you’ll receive writing assignments and exercises. You can use these exercises as stand-alone activities, or work them into an existing project. Each week we’ll cover a specific theme such as characterization, setting, dialogue and more. We’ll have a weekly check-in via our online members’ forum, giving you an opportunity to connect with other writers around the world. You will also discover (and rediscover) works by black women and women of colour authors. By the end of the course, you will have a collection of stories & prose, and a practical toolkit complete with writing guides, images, soundtracks and more! The ZORA course is designed to fit around busy and hectic lifestyles so there are no set times to be online (except for the weekly check-in) but we do recommend spending 20 minutes to an hour on each assignment. Assignments are sent Monday – Thursday. Full instructions will be emailed to participants a few days before the course starts. 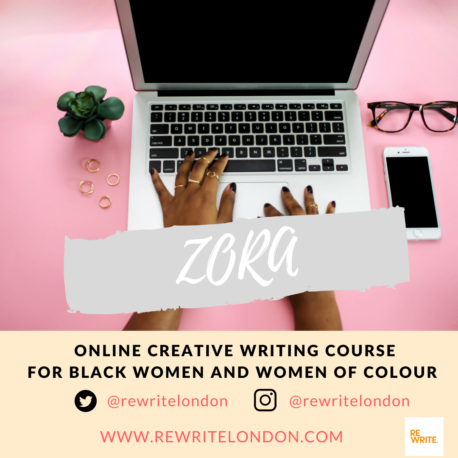 Black women and women of colour who want to nurture their creative writing practice. This is an online course for women around the globe. There will be an online forum for you to interact with other participants. Open to beginners and seasoned writers. We welcome black women and women of colour living around the globe (UK, USA, Africa, Asia Caribbean). THIS IS AN ONLINE COURSE OPEN TO WOMEN LIVING ANYWHERE IN THE WORLD.